Mike’s mother had always worried her wild child would have a serious accident. Then a motorbike crash landed him in hospital with a spinal injury. He phoned her and said: ‘You can stop worrying Mum, it’s happened.’ Click – end of call. At least, that’s the way the story goes about Michael Letch AOM, founder of Melbourne’s Disabled Divers Association, who passed away in 2013. The other image recalled by DDA members is of a man who revelled in the weightlessness of underwater activities, and who loathed the pull of gravity as he switched from dive gear to wheelchair. It’s thanks to Mike, and the association he founded, that I rediscover the joy of being in the water. I hadn’t been in the sea properly for 12 years, since becoming a wheelchair user. Getting into the water was for hydrotherapy and rehab not something you did for fun. But I’m lured by posts on social media advertising Coastcare Victoria’s ‘Summer by the Sea’ program, including events run by the DDA. DDA is well-coordinated and its volunteers passionate. They love the water and love helping people of all abilities to experience it. DDA President Bert Parker goes along way to see everyone is catered for and everything is made easy for participants. After registering online, I rock up at Ricketts Point in Beaumaris. At a pop-up gazebo, a team of people help me sign in and ‘gear up’ with a snorkel, mask and ‘wettie’ (dive-speak for wetsuit). Before I know it, I’m in the amphibious wheelchair, heading across the sand towards the ocean. My underwater escorts are Kade Mills (a marine biologist) and Sally a passionate young diver. After putting on the supplied wetsuit, mask and snorkel I transferred from my day chair into the yellow and blue amphibious chair. The team pushed me to the water’s edge and into the sea. In about one metre of warm ocean I clambered out and sat on the sandy seafloor. 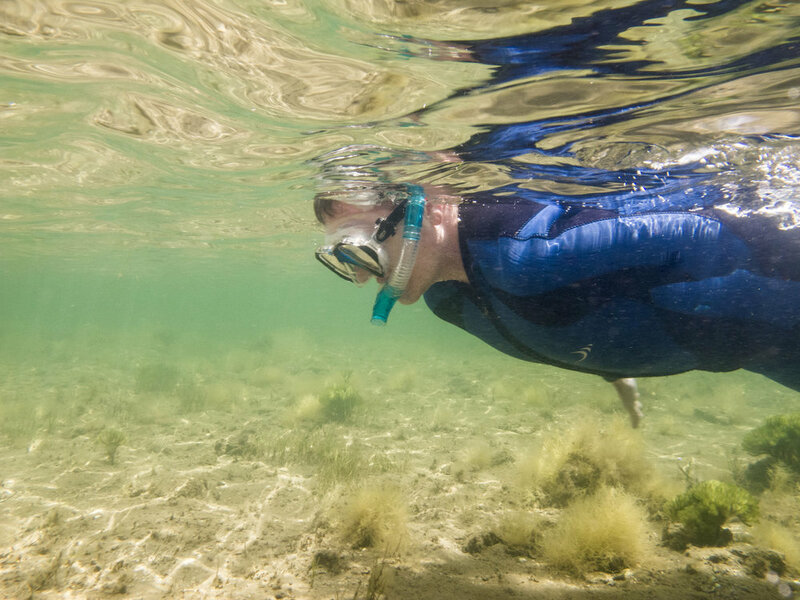 The water was up to my chest and I could hear my breathing through the snorkel. A quick briefing took place – Kade would swim on my right, Sally my left. I rolled over onto my stomach and started pulling myself forwards. The water is clear and I’m amazed by the life in humble Port Phillip Bay – we see eleven-armed starfish, pufferfish (fugu) and biscuit starfish. As we move through the water, I get priceless snippets of information from Kade and Sally. I’m told to keep a look out for the ‘puppies of the sea’ a harmless mollusc eating shark, the Port Jackson. ‘Adorable!’. Probably. The sun shines through to the seafloor, lighting up the underwater world in shades of bright green, yellow and orange. Kade calls it ‘his office’, and I can see why he might want to do overtime — it’s a tranquil paradise. Grateful and a little sad when it’s over, I immediately sign up for the next event in Altona the following week. This second time (a 40-degree scorcher) I’m accompanied by Kade and his daughter, as well as Chris from volunteer group Marine Care Ricketts Point. Water visibility isn’t as good, but it clears as we get further out, under the pier. The pylons offer their own curiosities – including mussels, dozens of types of seaweed and starfish. The water is about 23 degrees and the sky a photoshopped bright blue – a postcard-perfect day for snorkelling or swimming. We have use of the top-notch facilities at the Altona Life Saving Club. There’s a large wood-floored room with equipment in tubs, an organised fold-out table and an over-supply of sunscreen. DDA supplies the gear at these events, and the beach matting (the blue path over the sand for the amphibious chairs) is in place over summer courtesy of local councils. 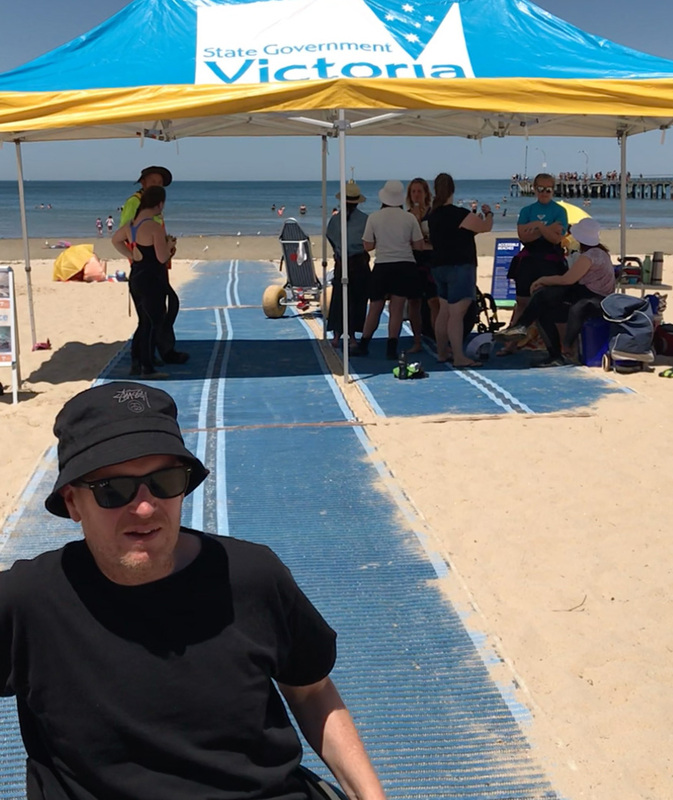 The beach wheelchairs at Altona belong to the Altona Life Saving Club – which kind of means they belong to Melburnians. There are three types: the ‘Sand Cruiser’ for assisted sand rolling; it’s junior edition, the Sand Piper; and the ‘MobiChair’. My only misgiving? Participation should be higher. How often can you tour the sea with marine biologists and other experts? Access, equipment and organisation can’t be faulted, and DDA volunteers and local government assistants are enthusiastic, dedicated and hard-working. I’ll be getting back in the water soon. Water offers freedom of movement — and on both occasions when I left the snorkelling gear for the wheelchair, I thought of that wild child who cursed how gravity felt on dry land. For details about the growing number of accessible beaches in Australia, see accessiblebeaches.com. Find out more about the Summer by the Sea program. Thanks to Bayside City Council, Hobsons Bay City Council, Coastcare Vic, Marine Care Ricketts Point. Special thanks to Bert, Ray, Kade, Sally, PT, Rachael, Amelia, Mary, Phillip, Chris and anyone else I might have missed. Photo credits to PT at Pink Tank Scuba. Altona beach was warm and wonderful. Rosalee & Sally sharing a diving story. The author in front of the event gazebo. 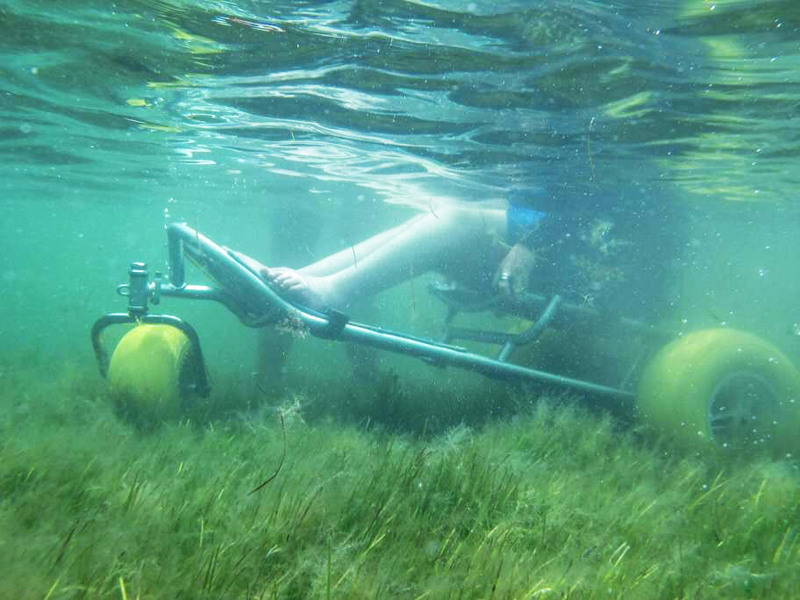 The amphibious Mobichair brings divers from the beach into the sea. The DDA is volunteer-lead and well organised. DDA President, Bert Parker and marine biologist, Kade Mills. Biscuit starfish are small and bright orange.